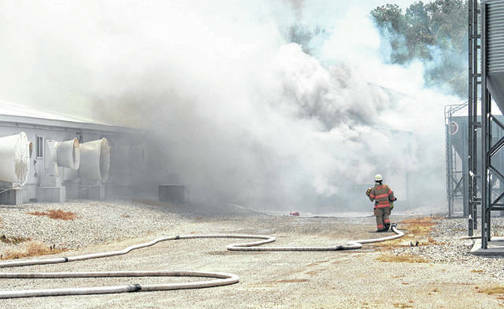 A firefighter battles a June 19 blaze that claimed approximately 5,000 swine in Fayette County. As investigators seek to find the cause of the massive fire that destroyed the Straathof Swine Farm facility in Wayne Township on June 19 and killed approximately 5,000 swine, the lengthy clean-up and disposal process at the scene has begun. https://www.timesgazette.com/wp-content/uploads/sites/33/2018/07/web1_Hog-fire-pic.jpgA firefighter battles a June 19 blaze that claimed approximately 5,000 swine in Fayette County.